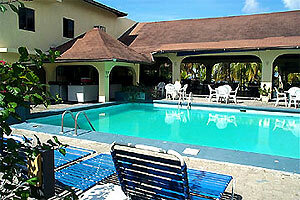 Negril Inn is beachfront property, located directly on Negril's 7 mile beach in Jamaica. Negril Inn. Pretty and intimate, enfolded in hibiscus and palms, Negril Inn is an adults-only resort where you can truly relax. Not that you can't indulge in tennis, aerobics, and watersports (this beach is one of island's best and whitest), but lounging is encouraged, too, along with such low-impact sports as table tennis and horseshoes. Badminton, competitive or genteel, is another option. Room amenities include hairdryer and satellite TV. Bicycle rental, small disco, nearby golf. AC. 46 Rooms.